Mary Jane Page, OCT, is not your average teacher and her classroom is far from traditional. And yet, it only takes a few clicks to see why the Ontario Business Educators’ Association (OBEA) has recognized her as its 2011 Innovative Business Education Teacher. Like most teachers, Page’s job includes communicating with students, parents and guidance counsellors, as well as updating resources and providing differentiated learning opportunities. The big difference here is that Page’s students come from across the Halton region map and they may literally never meet their teacher in-person. Virtually, it’s an altogether different story. Regular email and YouTube video communications are part of Page’s daily routine — this includes sending reminders of what’s due, what’s coming up and advice on how to master online learning. (Want a sneak-peek at Page’s time-management tips for her Careers and Civics students? Go to youtube.com/watch?v=Y93eApg_RA0. Page has taught online courses through Halton DSB’s e-learning department since 2005. The beauty of her programming is that students have the flexibility to learn and work at their own pace, where and when it suits them. This is key in their motivation and success. 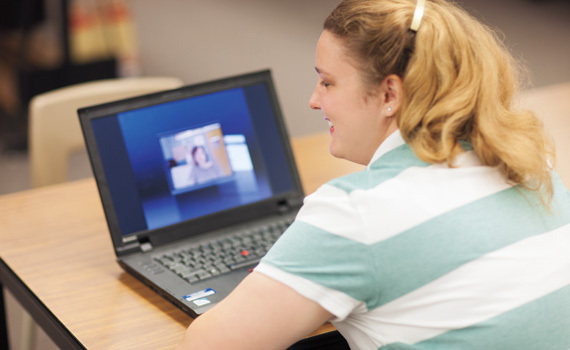 Halton has offered online courses since 2002, and during that year, 50 students took four courses. This year, 10 teachers will teach 25 different courses to over 850 students. Part of the program’s popularity is that students can take courses that aren’t offered at their home school, or are full or have been cancelled due to low enrolment. This is a frequent occurrence at smaller schools with fewer course offerings. After all, two students from every high school makes an online class of 32. Another significant benefit, says Page, is supporting students who can’t attend school. She’s taught kids who are suffering from serious illnesses, taking chemotherapy, recovering from concussions and major accidents. She’s also worked with elite athletes, as well as students who continue to earn credits while doing missionary work abroad. E-learning is a great complement to the traditional classroom. Teenagers love technology and the control that comes with working and learning independently. It’s no surprise she lets students negotiate their due dates for major assignments, as long as they set and meet goals for minor tasks along the way. She also allows them to make decisions on how they’ll approach major assignments. Her Grade 12 Entrepreneurship students create e-business websites using free web design programs like Google Sites , Wix or Weebly. When she teaches in a classroom, Page’s students are limited to using board-licensed software and their sites run on the often slower school server. •	presentations with Google — Presentations (google.com ➞ Documents ➞ Presentations). Check out sample e-business student projects at sites.google.com/site/mjpage1234/e-business and recent Civics presentations at youtube.com/playlist?list=PL8CE389CD828C695D&feature=mh_lolz. And nothing is more important than helping students find success, whether it’s on a couch in Burlington or on a mission halfway around the world. Mary Jane Page shares her five go-to tips on how to stay connected to your students while keeping up with everything else. 1) It’s time to start fresh. Don’t let your approach to content get stale and irrelevant. Keep an eye out for what’s currently exciting and incorporate free and paperless sources. Then you can feel good about sharing your find with as many teachers and students you’d like. 2) Tried, tested and true. Before launching into a new classroom tool — play it safe and test it out! Your students will sense your confidence and their comfort level with the latest software will automatically increase. This is particularity true for Web 2.0 tools. 3) Change isn’t always easy. Explain your new vision to your colleagues, department head and administration. You’ll be more likely to get the support and resources you’ll need to be innovative when you answer their questions and provide a clear strategy. 4) Learn from each other. If students are more familiar with a technology than you are, don’t hesitate to let them lead, teach and share. Remember, the teacher’s role is to provide guidance, content, structure, purpose and essential feedback along the way. When things go wrong, turn them into teaching opportunities. Then review and reflect on your practice. How would you do things differently? Were your students interested? What new approach might be more engaging for your students?